Powers/Abilities: vincent Mangano was a brilliant schemer with connections throughtout New York, extending to the American government. History: (Punisher: No Escape (fb, BTS))- Vincent Mangano was a Maggia crimelord who set up a drug dealing operation in New York. One his men, John Bartoli, had a confrontation with the Punisher, but the Punisher allowed him to live, hoping Bartoli would lead him to to Mangano. (Punisher: No Escape)- Mangano had Bartoli and his family killed, either because he was aware that the Punisher was shadowing him, or because Bartoli had been stealing his money. Mangano sent Bobby Peculo to trail the Punisher, but he wound up being slain. Using his connections in the government, Mangano had the Commission on Superhuman Activities send the U.S. Agent to apprehend the Punisher, and also hired Paladin to kill the Punisher for $10 million. After Paladin failed in his first attempt upon the Punisher, Mangano arranged to have his hitman Ralph Parlini released from Ryker's. Mangano joined Parlini and Paladin in another attempt on the Punisher's life, but they were stopped by the U.S. Agent, who was unaware how he had been manipulated by Mangano. After sending Parlini to assassinate City Rep Macchio, Mangano hoped to draw the Punisher out. He sent Paladin to capture Micrcochip and had him held at his mansion. The Punisher and U.S. Agent invaded the grounds, and defeated Paladin. 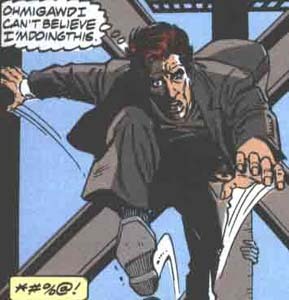 Fighting their way through the mansion, the Punisher pretended to be hit by Mangano when he shot at him, but only so that he could drop a grenade close to Mangano. Mangano was killed, and the Punisher had his body dressed in his costume, hoping to fool his enemies into thinking he was dead for awhile. Comments: Created by Gregory Wright, Tod Smith and Danny Bulanadi. Bartoli referred to Vincent as "uncle" at one point, but given the "family" nature of the Maggia, they may not have been related. Speaking of families, the Maggia seen in Punisher: No Escape are all very Italian. Okay, so the Maggia are good, and so is Paladin. Still, the Punisher's safehouses are that easy to find? Bobby Peculo and Paladin both found out where the Punisher and Microchip were with little difficulty during this story. 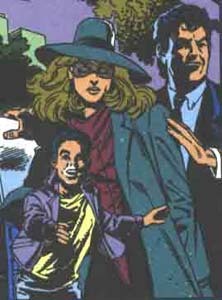 Paladin, although quite a mercenary, is particularly despicable in this story, serving an obvious villain like Mangano. And what did Paladin want that $10 million for? So he could retire! John Bartoli was a member of Mangano's Maggia family, and was involved in the drug trade. He had an encounter with the Punisher but was allowed to live in the hopes that he would lead the Punisher to Mangano. Mangano blew up Bartoli's house, killing him, his wife Rosa and his son Rob. The death of Bartoli's family drove the Punisher to bring down Mangano, seeing the death of Bartoli's family as similiar to his own family's violent end. Ralph Parlini was a hitman employed in Mangano's Maggia family, and co-owned an Italian restaurant in Little Italy with Bobby Peculo. Parlini was indicted for drug trafficking, harassment and involuntary manslaughter, and was imprisoned at Ryker's until Mangano had his release arranged. At the time of his release, Parlini was 36, married, and had one daughter. 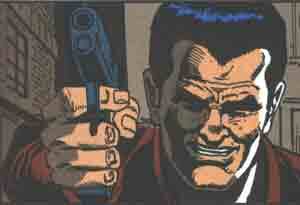 Parlini joined Mangano and Paladin in attempting to kill the Punisher, but failed. Mangano later sent him to kill City Rep Macchio, but after setting Macchio's home ablaze, he was apprehended by the U.S. Agent. Bobby Peculo was a member of Mangano's Maggia family, and co-owned an Italian restaurant in Little Italy with Ralph Parlini. Peculo was sent to trail the Punisher, but was spotted. Using up his ammunition in a firefight atop a subway car with the Punisher, Peculo allowed himself to fall from the car to his death, rather than tell the Punisher what he knew, as he knew Mangano would kill his family in retaliation.